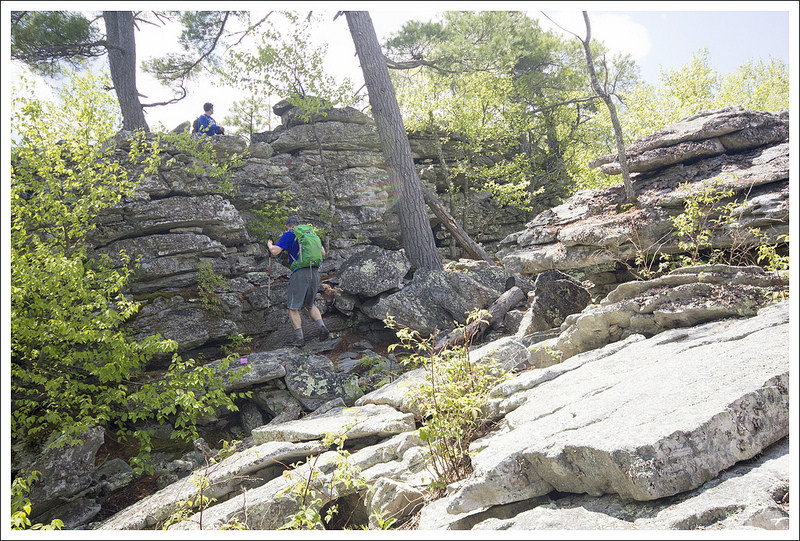 This 9.1 mile hike is challenging, but offers wonderful view payoffs and a fun rock scramble. There is a shorter option for this hike for people wanting to skip the toughest part of the climb. Crowds gather on one of Strickler Knob’s perches. One person we met at the summit had a Cavalier King Charles spaniel in her backpack. If you look closely at the photo, you can see the dog’s head sticking out of the pack. Cute! Below: The Massanutten Trailhead on Crisman Hollow Rd. ; Adam, Suzanne and Anthony begin the hike; Native pink azaleas. 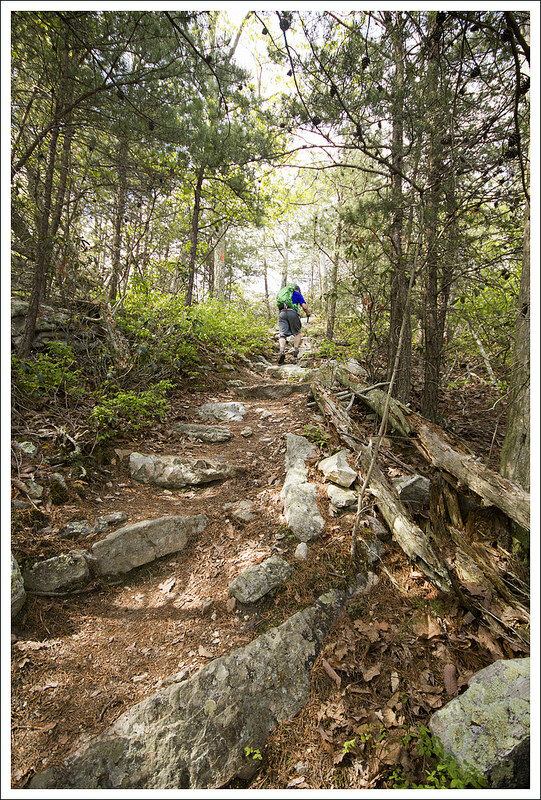 Strickler Knob was the second hike we posted on Virginia Trail Guide… way back in May of 2009. In the years since we first did this hike, there was a bad forest fire in the vicinity, the Forest Service painted over the purple/pink blazes to the knob (and then someone put them back), and the trail became vastly more popular. On this particularly beautiful morning, we were planning a hike in Shenandoah National Park, but at 7:45 a.m. a text popped up on my phone. It was from our friends, Suzanne and Anthony (we met them at PATC’s Backpacking 101 workshop several years ago). They had made a spur of the moment decision to drive down from Maryland to hike Strickler Knob and wondered if we might want to join them. We don’t see them often enough, so the answer was clearly YES! However, I had a few concerns going into the hike. The first was the possibility of swift/deep streams and run off from the deluge of rain we had received a day earlier. Roads and bridges were washed out all over the area. The second was the fact that the MMT 100 was being run that weekend. I wasn’t sure if the trail would be crowded or have limited access due to the race. We decided to put those concerns aside and go for it. We met our friends at the defunct Massanutten Visitor’s Center on Rt. 211 near Luray. From there, we proceeded in one car to the Massanutten Trailhead on Crisman Hollow Rd. Right as we arrived, a carload of six was also unloading at the trailhead. We ended up playing leap frog with them along the trail all day long. 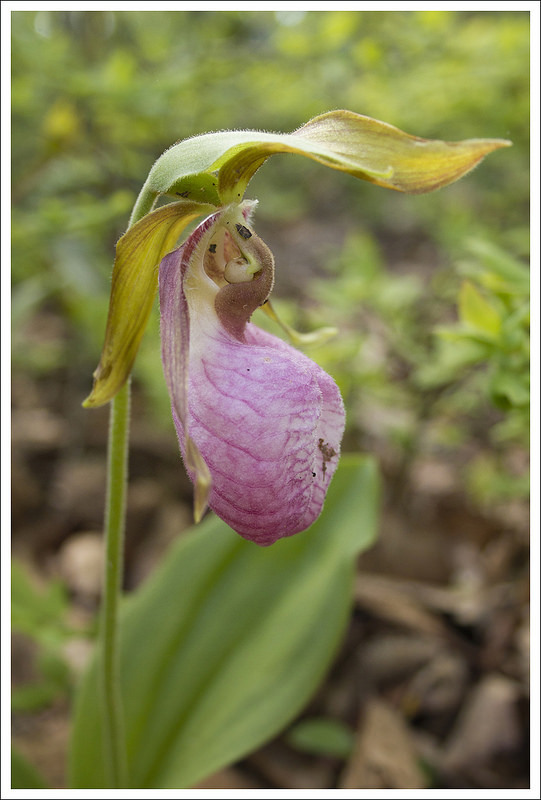 We spotted this beautiful pink lady’s slipper orchid along the trail. 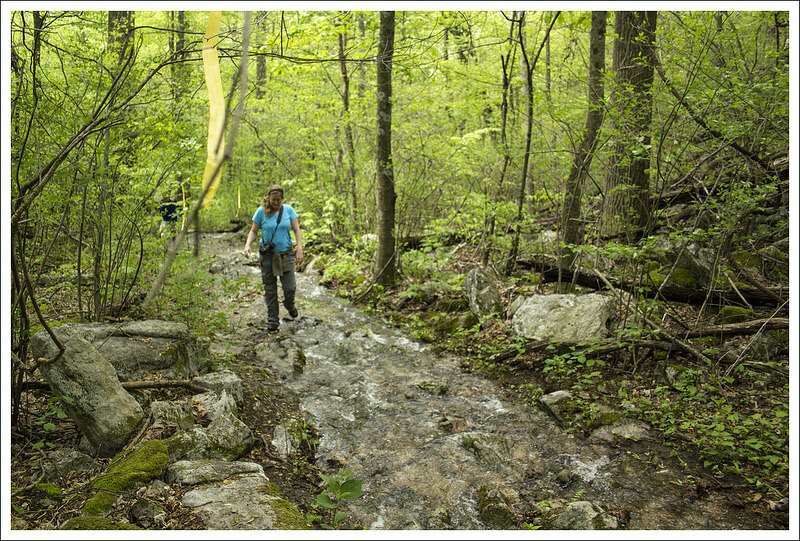 Below: Anthony and Suzanne make the steep descent of Waterfall Mountain; Mountain laurel is starting to bloom; Streams were running high. The trail initially crossed a flat, open area and a view into the valley. But soon, the trail dropped very steeply downhill on Waterfall Mountain. I’m not really sure why it’s called Waterfall Mountain. We didn’t see any waterfalls along the way – maybe they’re someplace else, or maybe ‘waterfall’ just refers to the extremely quick drop in elevation. Along this section of trail, we all joked about what a tough climb uphill this would be at the end of the day. I enjoyed the flowers blooming along the trail. 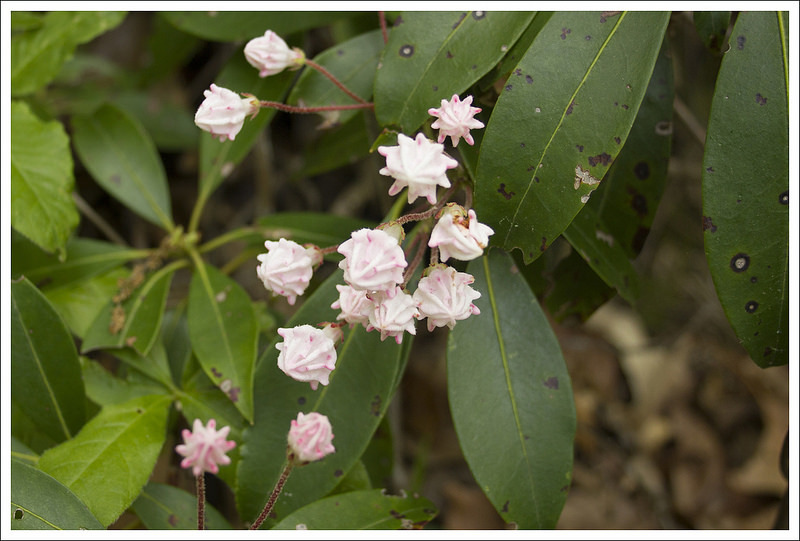 We spotted mountain laurel starting to bud and even a pink lady’s slipper! Eventually the trail leveled out near a stream. We passed a large campsite near the water just before coming to our first stream crossing. The water was pretty high and fast, but some well-placed logs made the crossing doable. From there, the trail followed a series of ascents and descents with lots of little stream crossings along the way. Most of the small stream crossings are probably dry under normal circumstances. We soon came to a second large stream crossing. After that crossing, the trail followed the stream – literally. Due to the 4-5 inches of rain the area experienced, the trail was completely underwater. It didn’t even look like a trail, and the only way we were sure it was the trail was the presence of a blaze on a tree about 50 yards ahead. We walked for more than a mile in ankle deep water. It was fun, but it was also wet, sloppy and muddy! We reached trail junction 408. This is where the folks coming up from Scothorn Gap join the trail. At this point, we turned right and followed the orange-blazed Massanutten Trail uphill in the direction of the Gap Creek Trail. 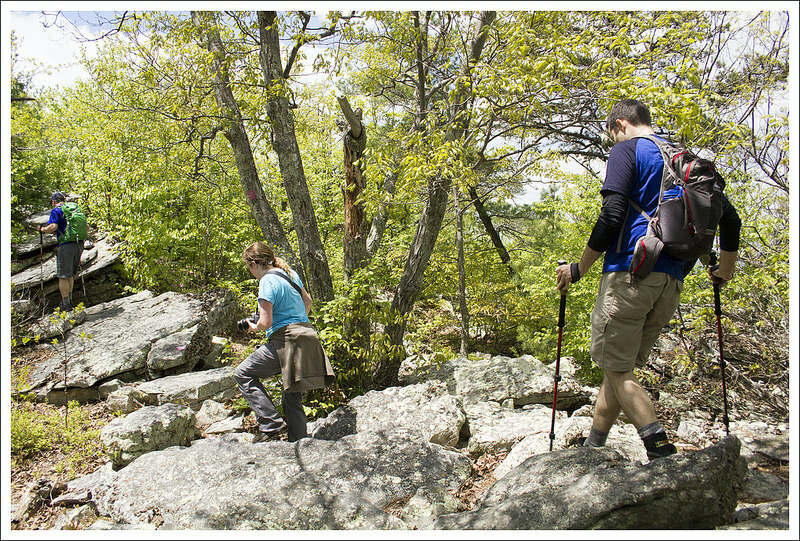 This part of the trail is really easy – wide and very gently graded. 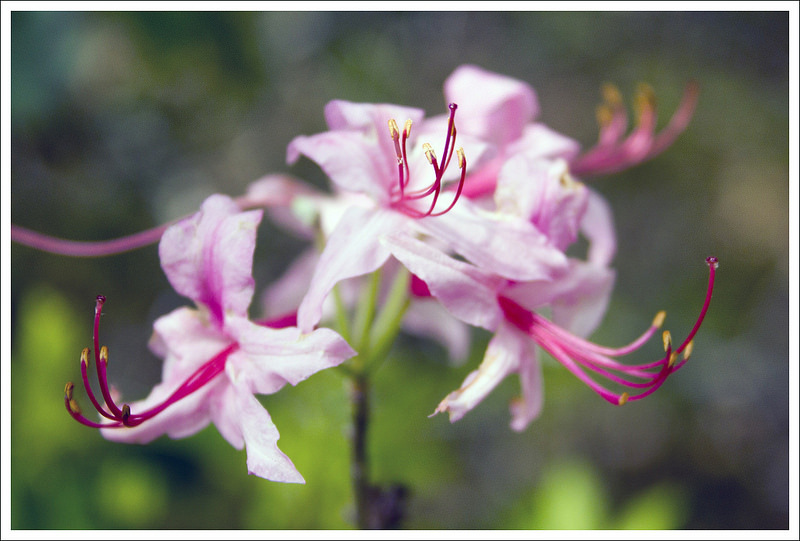 There were lots of pink native azaleas on one side of the trail. 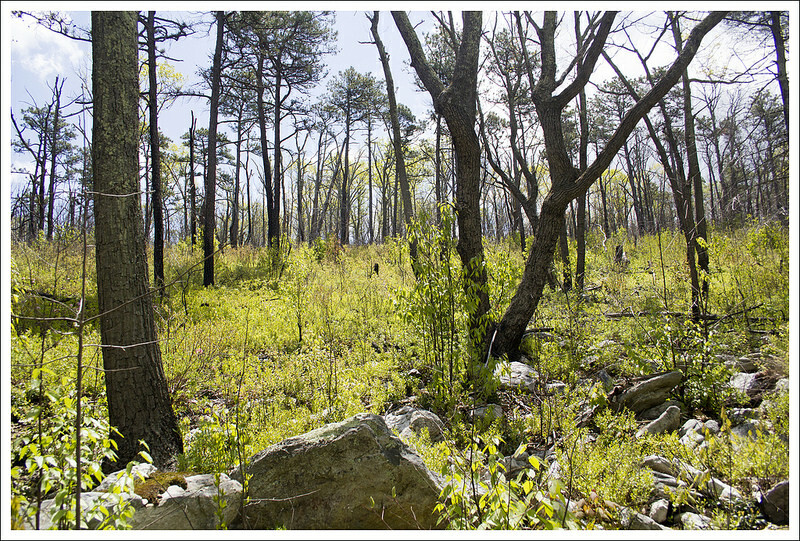 On the other side, the area burned out by a forest fire stood, charred – but slowly growing back. 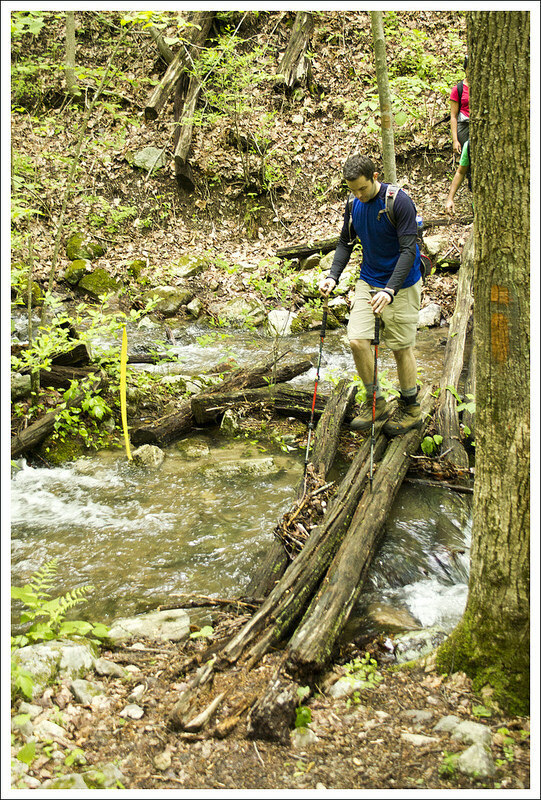 Anthony makes his way across the logs traversing the stream. Below: Adam walks along one of the only flat sections of the trail. It was a really short section; Suzanne walks along the under-water trail; This is the trail junction that trips a lot of people up. 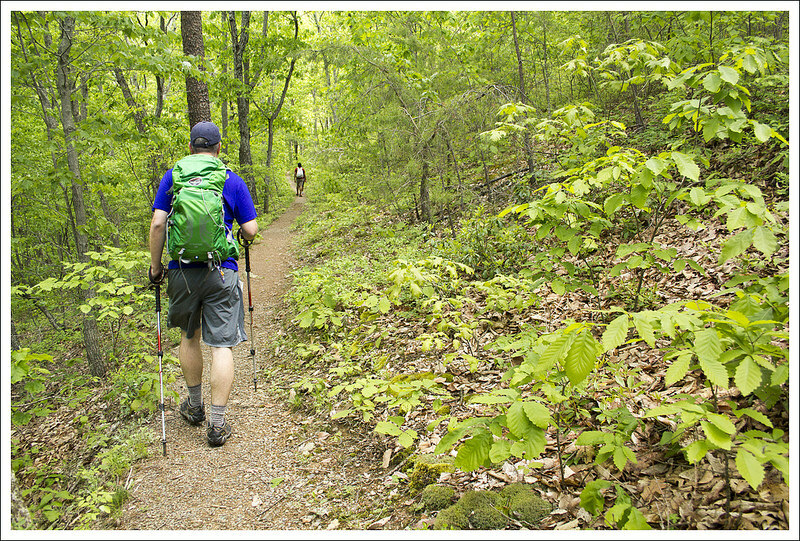 Make sure you go uphill, remaining on the Massanutten trail, in the direction of Gap Creek. When we reached the ridge, there was an obstructed view where the trail continues over the crest and then downhill. If you find yourself going downhill on the orange-blazed trail, you’ve passed the turn to Strickler Knob! At the top of the ridge, look carefully for purple/pink blazes on rocks and a reddish disk stapled to a tree. This is the way to Strickler Knob. The walk to the knob starts off as a rocky but easily passable trail. But gradually the rocks become bigger, more jagged and trickier to traverse. It’s easy to lose the blazes as you pick your way along the rocks. You’ll come to one stunning viewpoint and think you’ve reached the end, but you still have the most intense part of the scramble to go! 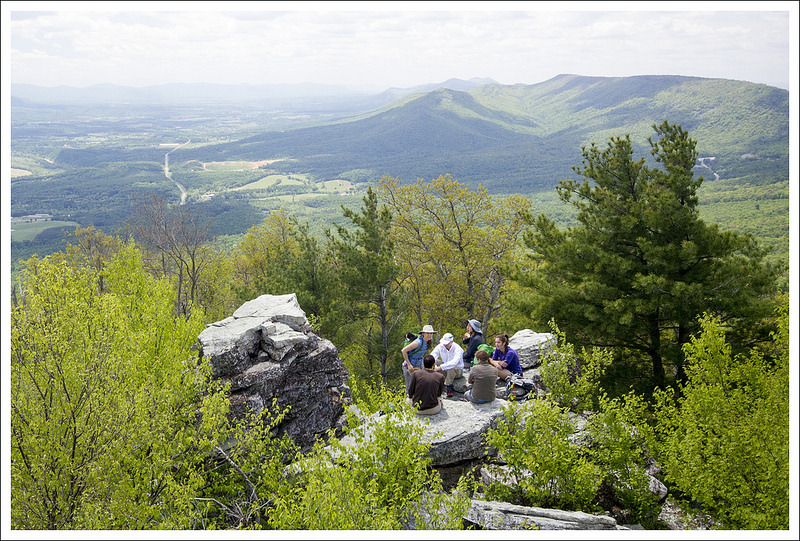 There are several steep, tall rock faces to negotiate before you finally come to a collection of towering rock stacks overlooking the Page Valley, Fort Valley and the Shenandoah River. The view from the knob is majestic! On this particular day, Strickler Knob was packed. There were so many people at the overlook, it was hard to find a spot to sit. I think part of it was because the presence of two hiking clubs. But in addition to the clubs, there were also a number of couples and foursomes. Honestly, I’m shocked that this trail has become so popular! 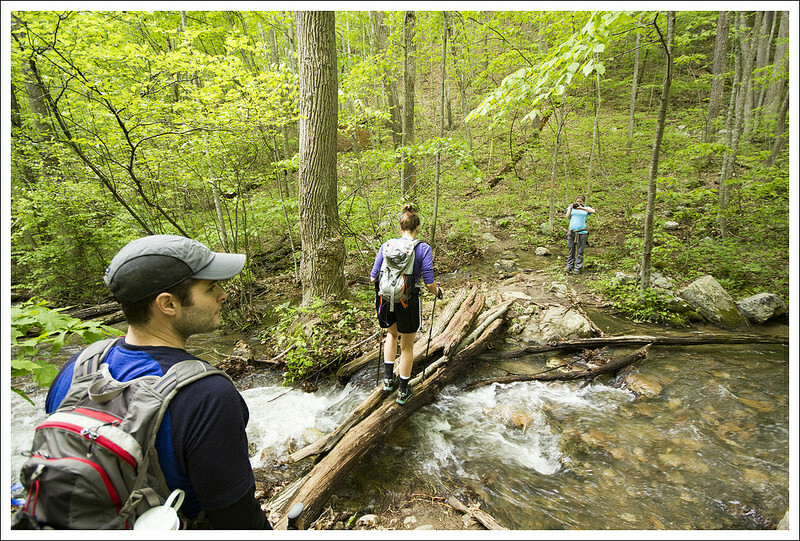 The crowds rivaled what I expect to see on a nice day on trails like Dark Hollow Falls or Hawksbill Mountain (in SNP). We spent some time at the overlook eating lunch and taking photos. The hike back went really quickly. We walked in the water, we crossed the streams, we did all the little ascents and descents… and then we came to the base of Waterfall Mountain. That climb was every bit as brutal as we all expected – gaining over 800 feet in about half a mile. The section isn’t climbed with mediating steps or switchbacks – it’s pretty much straight up the mountainside. We were all pretty glad when we got back to the flat, grassy section again! When we got back to the car, the parking lot was much more crowded than when we had left it. We made the short drive back to the Massanutten Visitor’s Center and bid farewell to Anthony and Suzanne. It was a great hike and great to see them! This area was burned by a forest fire several years ago. There is still a lot of black char, but new growth is starting to emerge. 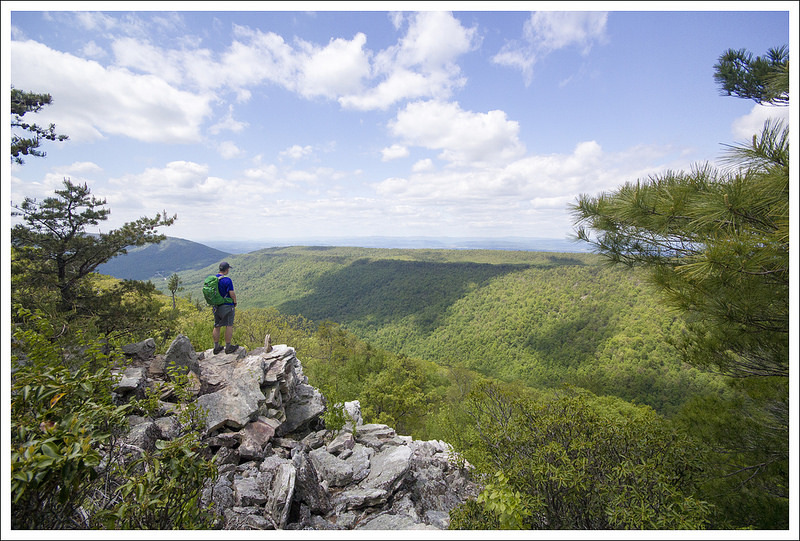 Below: The beginning of the Strickler Knob trail; Adam enjoys the first nice view; The scramble begins! Between the two routes to Strickler Knob, I would probably recommend the shorter route from Scothorn Gap to most hikers. You get all of the excellent scenery, and only miss the extremely challenging descent/ascent of Waterfall Mountain. The section on Waterfall Mountain doesn’t really offer any remarkable scenery, but it’s a great training hike if you’re looking for a cardio challenge or practice on elevation change. 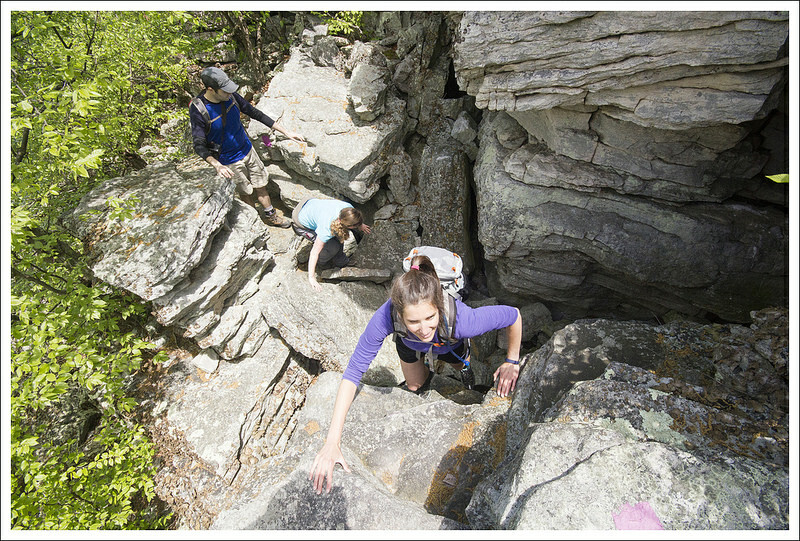 We probably benefited from the longer, tougher ascent to prepare for our upcoming Smokies Trip. 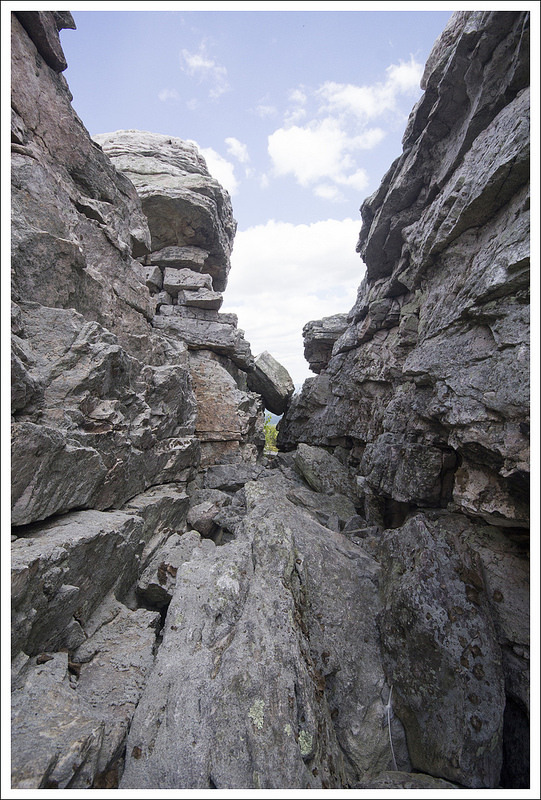 Normally, when I describe the hike to Strickler Knob, I tell people that it’s an introductory rock-scrambling hike to see if you are ready for Old Rag. 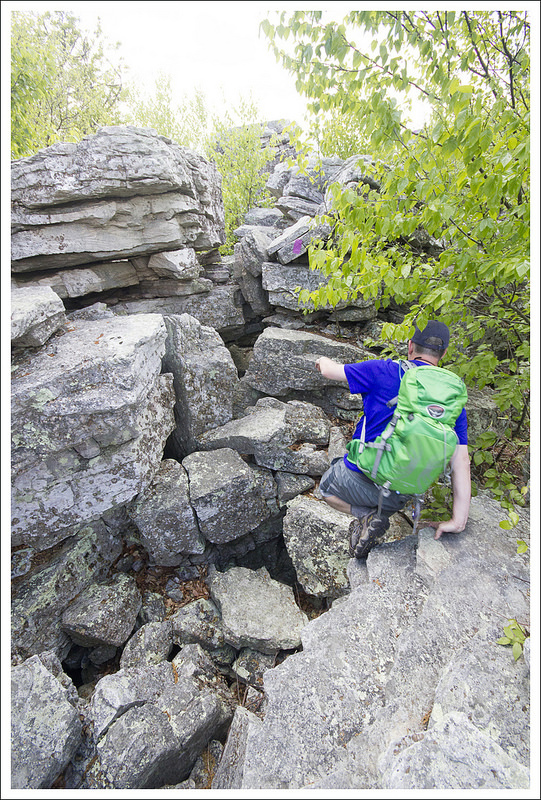 While there is not as much rock-scrambling and navigating as Old Rag, there are a few spots towards the summit that will test you enough to see if you can pull yourself up some of the rocks and let you gauge your comfort-level with scrambling over some drops. If you’ve already done Old Rag, this should be easy, but if you are intimidated by Old Rag from stories you’ve heard, try Strickler Knob first. I would agree with Christine that this hike has become more popular over recent years. When we had done the hike five years ago on a beautiful day, we only ran into one other couple on the entire trail; this time, it was crawling with people. This is also a hike where people often get lost. You won’t find the purple-blazed summit trail on any maps currently, so I would suggest bringing a copy of the map I’ve provided below. I had a co-worker that tried to find the trail a few years ago (possibly when the blazes were still removed) to no luck. 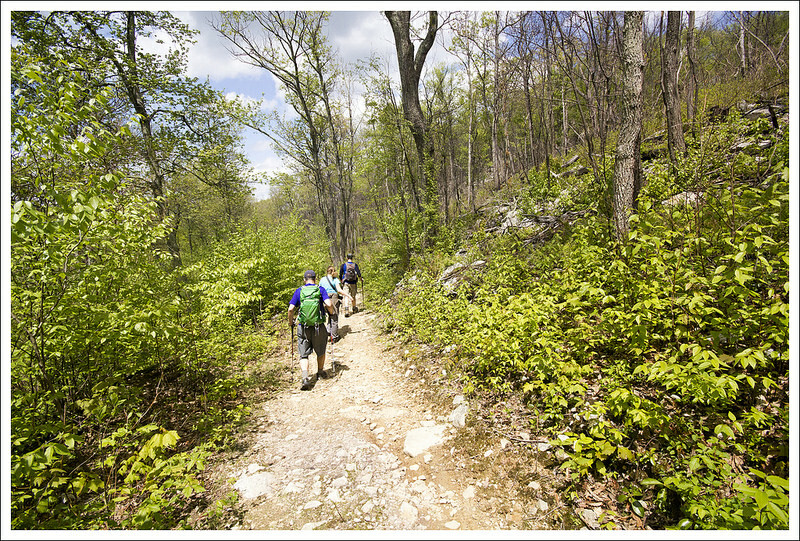 We also came across a larger hiking group from Northern Virginia that had missed the trail completely. When we gave them better directions, they turned around to attempt it again. Part of this also has to do with what few blazes are actually on the trail. You’ll know you are on a trail, you may just not be entirely sure which trail. The group negotiates the rock scramble. 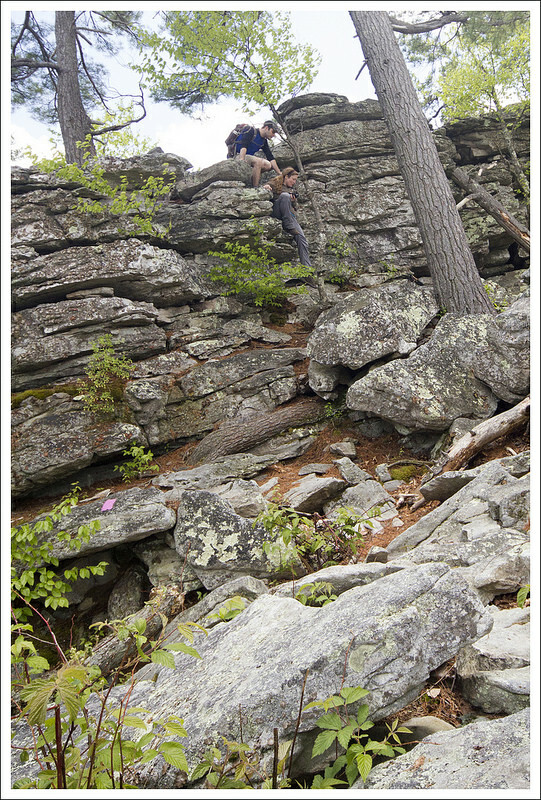 Below: Adam makes his way through the rocks; Lots of rocks to climb; A nice perch on Strickler Knob. We started off the hike from the small parking area on Crisman Hollow Road. 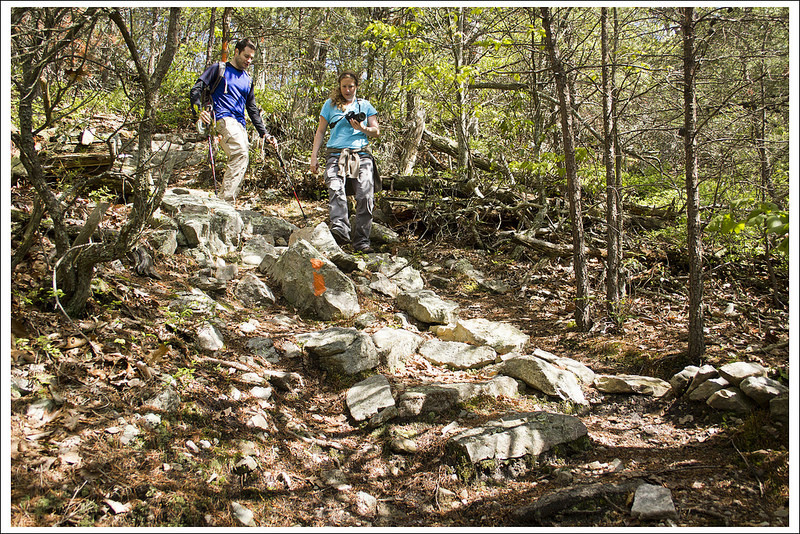 The orange-blazed Massanutten trail starts off on nice, level terrain through a wooded area. The trail soon opens up to more of a brushy, open field. As the trail winds around through this area, there is even one spot that has a view into the valley below at .2 miles. Shortly after this point as the trail winds around, the trail begins its very steep descent down Waterfall Mountain at .5 miles. The entire time that we were hiking down, I was thinking this was going to be a pain to hike back up at the end of the hike. The trail does have a few switchbacks, but the overall descent is tough on the knees as you descend about 800 feet in that half mile. At the 1.0 mile marker, we finally reached the bottom of the descent and a junction with the Massanutten Connector Trail. 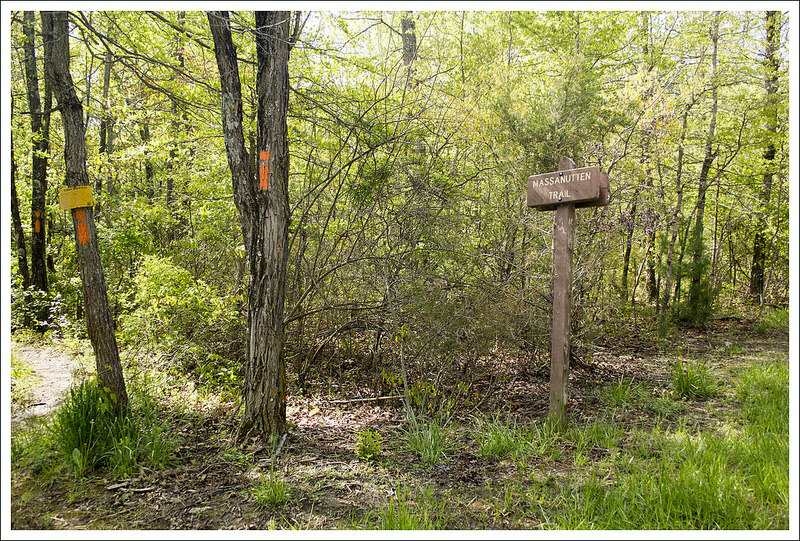 Take a left at this junction to stay on the main, orange-blazed Massanutten trail. The trail begins to climb slightly at this point and at 1.2 miles, you will reach a nice back-country campsite along the side of the Big Run stream. You’ll soon cross the stream (usually by balancing yourself along logs that have been laid across) and continue your climb. After the second stream crossing, the trail begins a steeper climb with a large switchback to help ease the elevation gain. The summit was very crowded, but the views were still fantastic! Eventually the trail met the stream again and due to the heavy rains, the trail was completely submerged. We ended up hiking what felt like almost a mile through a submerged trail by rock-hopping or just getting our feet wet and muddy. The trail finally separated from the water and leveled out and we reached the junction with the yellow-blazed Scothorn Gap trail at 3.0 miles. Take a right at this junction to stay on the orange-blazed Massanutten trail. The trail feels more like a fire road at this point, as you’ll climb up slightly. We were able to see a lot of the fire damage to the trees around, so there is little more than some lower brushy, understory on the trail at this point. At 3.6 miles, you reach the crest of the trail and can see some obstructed views straight ahead. At this point, look around to your right. We found a small cairn on the ground and were able to see some red and purple blazes higher than eye-level on a few trees to mark the beginning of the purple-blazed trail to the summit of Strickler Knob. The purple blazes at this point are typically marked on the rocks where you step. The trail is very rocky at this point and you will be walking the ridgeline until you reach the summit. The trail can also be a little hard to follow, but if you keep looking for the blazes and just remember you are walking the crest of the ridge, you should be fine. 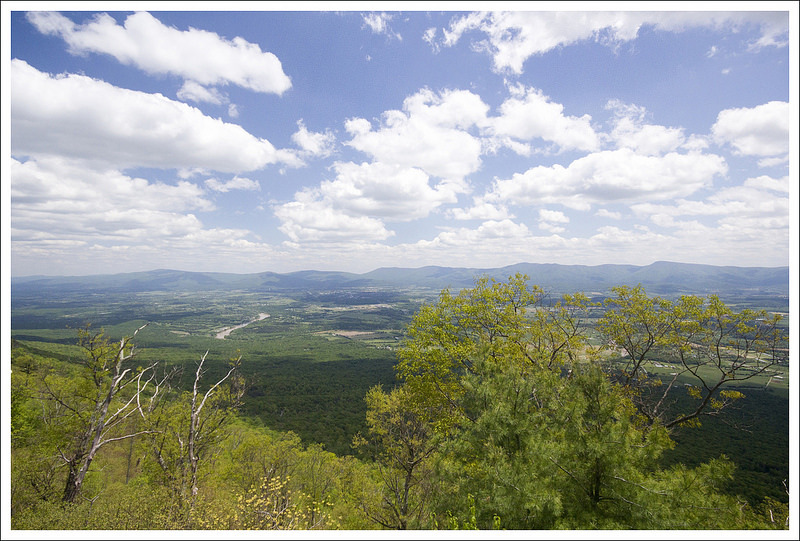 At 4.2 miles, you reach a very nice viewpoint where you can get great views to the west. Keep pressing forward and you’ll soon need to climb up a larger rock wall and then pass by a primitive campsite. 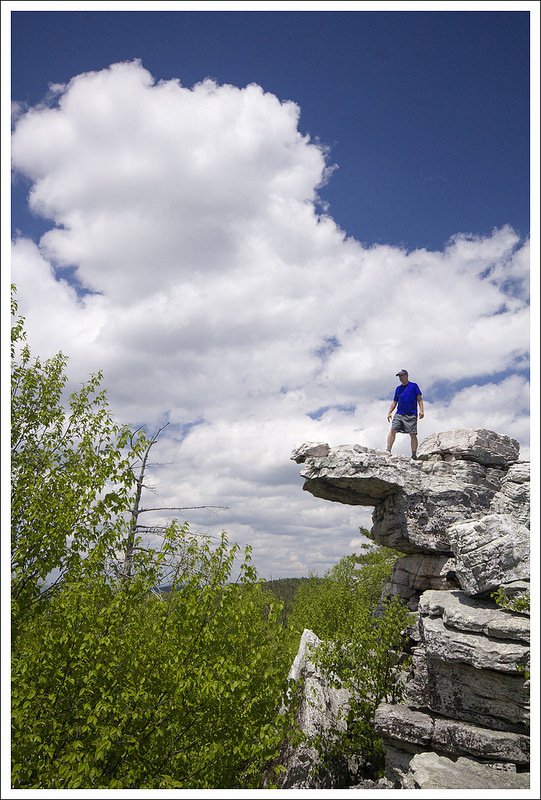 Just a few 100 feet away, you will reach the larger boulders of Strickler Knob at 4.5 miles. You’ll see a large rock overhang that you’ll climb under. There is a small area to take in a few views to the right. For those that are most adventurous, the best views are to the left where the overhang is. If you feel comfortable, you will need to navigate a crack between the two larger rock formations and hoist yourself up to the top of the rocks. The views from both rock formations are absolutely breathtaking as you have 360-degree views from all around the valley. The climb down is as challenging as the climb up! Below: More views from the top; The hike down; One final stream crossing. After eating a packed lunch, we made our way back the way we came. We did have to face the waterlogged trail again. We came across several groups on our way back that were also looking for directions. One girl asked me if there was any other way back to the car other than going back up Waterfall Mountain. I suggested that they make their way back through Scothorn Gap and then walk Crisman Hollow Road back. We all definitely wished we didn’t have that steep trek back up Waterfall Mountain to do. It is a very steep trail almost straight up the mountain and it takes quite an athlete to do this without taking a breather at some point on the return. When we finally reached the top, we congratulated our success and then made the last .5 miles back to our car. When we were hiking the trail, I kept thinking about the MMT 100 racers that were running this trail. We had come across one of the race-workers and he told us that most of the fast runners were coming through this area near Waterfall Mountain around 8 p.m. So, if you were a little slower than that you would be running this trail in the dark with a headlamp. I can’t even imagine how tough this would be and how any of them would escape injury from running into a tree, twisting an ankle, or falling down the trail. The brutal ascent back up Waterfall Mountain at the end of the hike. I would also recommend for most people to do the hike from Scothorn Gap instead of the route we took. It is a lot of extra effort with nothing overly impressive to see along the way. It was great to see our friends again. We were all getting ready to head to the Great Smoky Mountains soon, so this was great training before we had to handle some of the tougher terrain that the park had to offer. Elevation Change – About 2250 ft. Difficulty – 5. This rating is earned by both the hike length, the scramble to the knob, and the ascent of Waterfall Mountain that comes right at the end of the hike. For an easier version of this hike, start at Scothorn Gap. Trail Conditions – 2. No switchbacks, soggy streambeds, a couple crossings that can be challenging in wet weather, and a tough scramble. This is not a beginner’s hike. Views – 5. Views from the knob are spectacular. Streams/Waterfalls – 2.5. 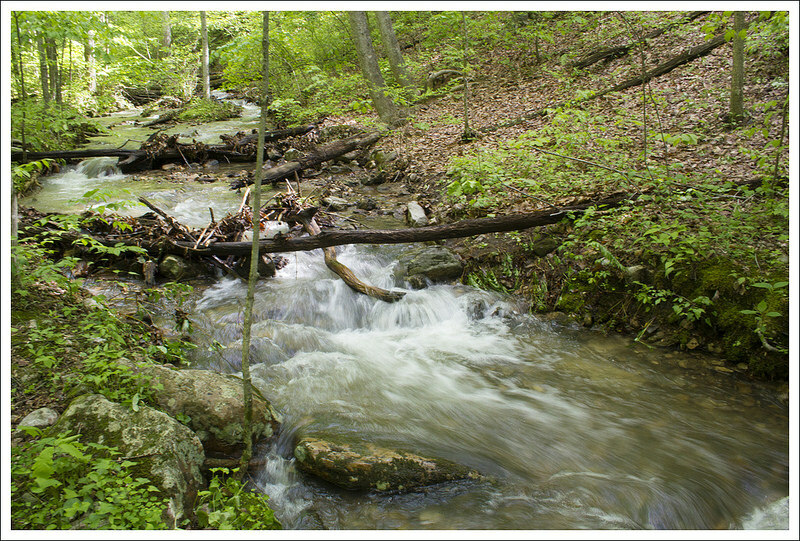 The usually low streams were beautiful and running high when we visited, but they’re probably usually less impressive. Wildlife – 0. This trail is popular enough to scare away most wildlife. Ease to Navigate – 2. Trails are sporadically blazed and can be hard to follow. The junctions for trails leading to to the knob do not mention Strickler Knob. 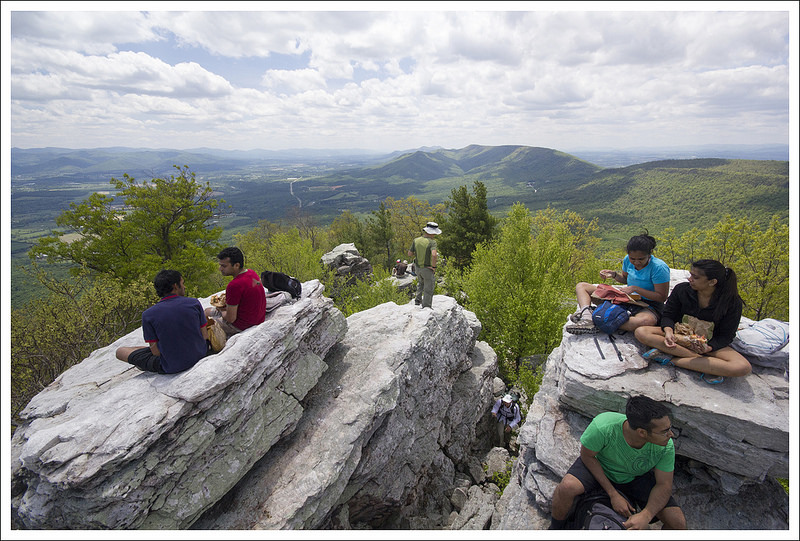 We suggest bringing a map on this hike. Solitude – 2. This trail has become extremely popular! 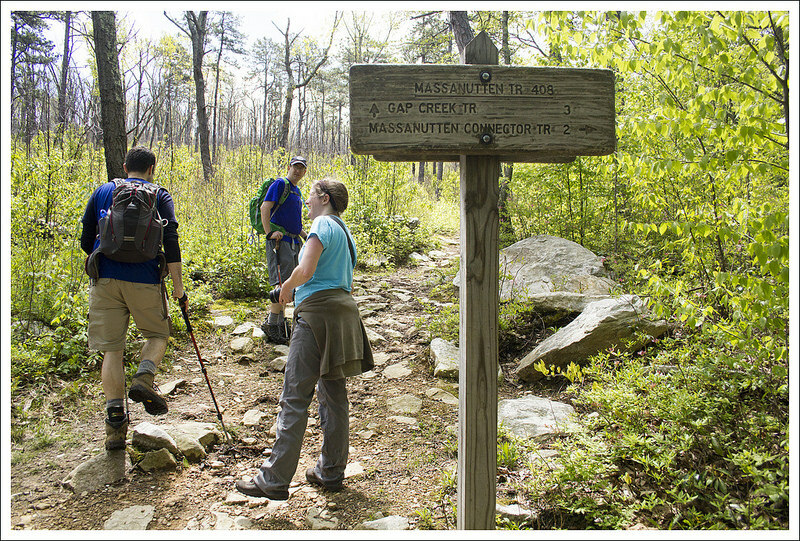 Directions to trailhead: From I-81, take exit 264 heading east through New Market. Head east on West Old Cross Road for .2 miles. Turn left on to US-11/N. Congress Street. In .3 miles, turn right on to US-211/Lee Highway. Go 3.6 miles and turn left on to Crisman Hollow Road (it is right before the green building on your right that is the Massanutten Visitors Center). 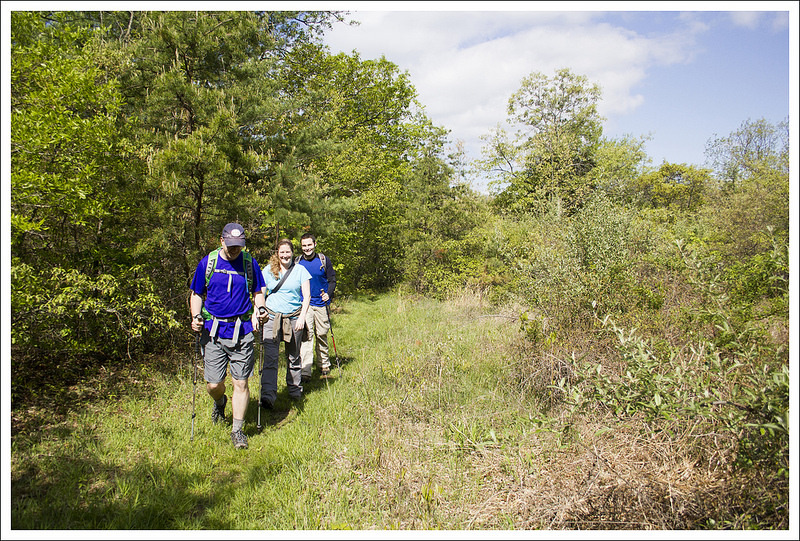 Follow Crisman Hollow Road for 2.2 miles (passing by the parking lot for the Massanutten Storybook Trail) until you reach where the orange-blazed Massanutten Mountain Trail crosses the road and the small parking area. Park here, cross the road and start the trail. How nearby are you looking for? Within an hour and a half of Charlottesville would be ideal. These two come to mind! Awesome, thank you for the recommendations! I’ve been reading about your hikes on my iPhone, but it is easier to comment on my computer and also to see the photos better. This looks like a great hike, and one that I would like to try. Not an easy one but great scenery. Very nice article and pictures. It is a magical place. One clarification: Once you leave the orange-blazed Massanutten loop trail, you are no longer on a sanctioned Forest Service trail. It is a “renegade” trail. The lavender blazes disappeared a few years ago because the NFS tried to remove them all. As you have noted, they have reappeared. Bureaucracy and lack of funds has prevented the NFS from making the trail official. It is not illegal to hike it, but it is illegal (and therefore brazen and brave!) to clear or maintain the trail, or put up signs or blazes. Interesting info, Ron! The blazes are so frequently placed along the trail and well-maintained. They certainly look official! haha I think the trail remains well-cleared now by the constant presence of human feet. We were shocked by the crowds on that trail.